Today's New York Times contains David Pogue's funny review of iPad: The Apple iPad is basically a gigantic iPod Touch. The review is in two sections: one for tech-heads, one for "regular people." The upshot seems to be that while regular people will probably love the iPad, tecchies are less enthusiastic. (Perhaps this is true of all things in life.) Some quotes from the review follow. There’s an e-book reader app, but it’s not going to rescue the newspaper and book industries (sorry, media pundits). The selection is puny (60,000 titles for now). You can’t read well in direct sunlight. At 1.5 pounds, the iPad gets heavy in your hand after awhile (the Kindle is 10 ounces). And you can’t read books from the Apple bookstore on any other machine — not even a Mac or iPhone. The new iBooks e-reader app is filled with endearing grace notes. For example, when you turn a page, the animated page edge actually follows your finger’s position and speed as it curls, just like a paper page. Font, size and brightness controls appear when you tap. Tap a word to get a dictionary definition, bookmark your spot or look it up on Google or Wikipedia. There’s even a rotation-lock switch on the edge of the iPad so you can read in bed on your side without fear that the image will rotate. I want to fast-forward three to five years ahead, when the little bugs are fixed and the price is low and I can just go get one of these. Or, you know, an iPhone. It's hard waiting for technology to smooth out! Another NYT article, this one on how since e-books have no discernable covers when you are reading them (all an onlooker can see is the device you're using to read), the e-book thus takes away a certain instant visual marketing/advertising component from publishers. It's here. I can say that I've had several conversations with people who have Kindles, mostly on planes. Usually, we are discussing how much we enjoy the device, or how much we like the other person's carrying case or whatever. What we're reading at the time tends not to get mentioned. I have to say, I love trying to see the covers of other people's books. Perhaps e-book readers need a back window, one that shows the cover or title of the book you're reading. Or not. As much as I love seeing what other people are reading, I love even more the fact that e-book readers enable me to "anonymously" read or buy any old trashy thing I feel like. In general, I probably shouldn't worry about that kind of thing, but that's another topic for another day. Kobo on iPad from Kobo on Vimeo. I have the Kobo app on my iPod Touch, but I don't really use it. It's nice for browsing books and it has a very pretty interface. Browsing is nice because there are so many categories: what they call browse is all arranged by subject, where discover has all sorts of interesting categories like what's new, NYT bestseller, in the news, hidden gems, and many more. However, I haven't actually read anything with Kobo. I mean, am I really supposed to be able to resist this? I can't shut up about this. It's pure genius: great idea, perfectly executed. --Successful politicians are consummate people persons who are manipulative and able to "work" people, whether or not they intend to. They may be so charismatic that they simply do not realize their effect on others. 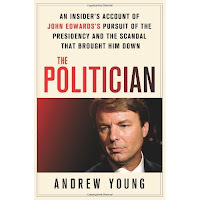 Since Young was not a seasoned campaign worker or political person, he was startstruck by the Edwardses to begin with. He also came to love Edwards the man, and Elizabeth Edwards, and considered them close friends. The Edwardses returned that affection, often referring to Young as "family." All lines between friendship/admiration/hero worship/the workplace were blurred. --The desire to be near power or associated with power and fame makes people lose sight of themselves. --Young's sense of his own identity as an adult was fuzzy and incomplete. Why did Young not walk away early on? He says he ended up feeling trapped in a situation that kept worsening. Edwards kept raising his salary, and he wanted Edwards in office, and he kind of ended up having to hang around until that happened, I guess. I'm not sure. At the end, Young hints about his complex relationship with his own father, who had also committed adultery, and points out how people who are flawed and fail can recover if they are honest. Young did a lot of awful things. He helped Edwards conceal his affair from his wife, who was suffering from cancer. This is almost too horrible to be believable. Edwards claims Elizabeth was "in remission" at the time his affair with Hunter began. Whatever. Young also claims that Elizabeth Edwards was difficult, obstructive, unpleasant, and close to crazy by the end. He suggests but does not say outright that she pretended her cancer was worse than it was to gain media attention and support. Obviously, Young is resentful of the Edwardses, who cut him off after he was used horribly. He does attempt to take responsibility for his own culpability. I am amazed his wife, Cheri, put up with his behavior, because in effect, Young ignored his own family to serve the Edwardses for years on end. He even ended up helping the Edwardses decorate for Christmas and purchase presents--instead of helping his own family. At one point, his mother in law simply turns her back on Young in fury and disgust. This was definitely the kind of thing he deserved! This book provides an interesting look at Edwards, although since it is clearly tinged with resentment and hurt feelings, it must be taken with a grain of salt. I would like to hear Elizabeth Edwards's take on some of these things; I did find it a bit hard to believe she was as crazy and shrewlike as Young potrays her. 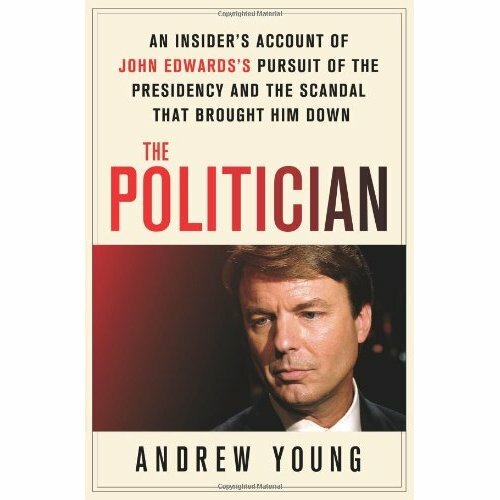 I was disgusted thoroughly with Edwards before I read this book, and after reading it, I still am, though I feel some small sympathy for him. However, I'm mostly really glad he did not make it to a serious position of power. Young, I hope, will not become anyone else's personal assistant or aide. He is not the type of personality to function well in such a role, the book shows. I found Young's refusal to see the truth of his situation very frustrating--but who of us has not had huge blindspots in life, or times of denial. I can only hope my own never lead me to enable (or engage in) behavior like Edwards's. The audiobook is read by Kevin Foley, who has a nice, booming voice that is pleasant to the ear. I am not fond of the southern accent he adopted for Edwards, and I haven't heard Edwards speak enough to know if it was accurate. In places, Foley gets the emphasis of sentences wrong/misreads a bit--but all in all, the book is good to listen to. I first became aware of Judith Warner through reading her posts at the New York Times's online Opinionator blog. I am sad to see she has stopped contributing to the blog. Warner wrote on politics and society and gender and class, but her focus was often on parenting and motherhood. I am not a mother, so I did not read her posts regularly, but when I come upon them, I usually found them witty and pithy, well worth reading. In general, I like the way she thinks. She is not afraid to go out on a limb, or to be wrong, and sometimes, she changes her position on issues as years go by. I really appreciate that kind of intellectual flexibility and courage. In chapter 1, she tells us that the book she initially intended to write was conceived of as "UNTITLED on Affluent Parents and Neurotic Kids." It was supposed to explore "fashionable children's diagnoses"--like Asperger's disorder, dyslexia, attention-deficit/hyperactivity disorder, oppositional defiant disorder, anxiety disorders, and bipolar disorder. . . . Its central argument was going to be that children were, by and large, being overdiagnosed and overmedicated. 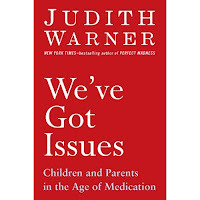 What Warner found as she researched and read further was that in general, parents of children with mental disorders would vastly prefer not to medicate their children, or to have them diagnosed. In the end, they have done so only because they have had to; because their children were suffering (and the whole family was suffering) and the parents were at wit's end. In these cases, medical/psychiatric intervention turned out to be the only thing that would work. Ultimately, these were last-resort measures, for the most part, not frivolous or lazy decisions. Therefore, instead of being critical of parents (and I have to admit, it is very, very easy to be disgusted with some of the more popular excesses that get bandied about) and claiming that the sickness of our culture creates mentally ill people (instead of these things being something we do not control), Warner ultimately comes from the issue with a sense of compassion for the struggles of the parents and children who suffer mental disorders. She notes how our society tends to ignore or stigmatize mental illness as a whole, and in children in particular, and how these parents and kids often get overlooked because of this stigma or indifference. The idea of showing concern instead of scorn for these kids/parents strikes me as exactly the right direction to take. If we blame the kids who suffer these disorders, we only hurt them further; if we blame their parents, call them "bad parents" instead of "people whose kids need help," then we paralyze them with shame and make it that much harder for them to get help for their familites. 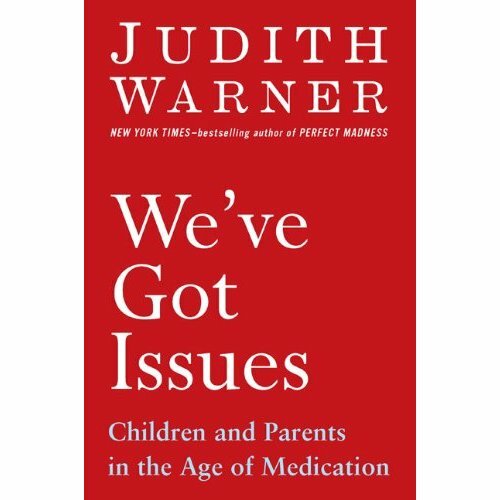 Warner points out repeatedly that while our society talks incessantly about how many children are overmedicated and overdiagnosed, when she spoke with the actual doctors, parents, and teachers who worked with these kids, she rarely found anyone who felt the medications/therapy were being dispensed frivolously. Whether or not one agrees with this, I definitely support Warner's belief that kids with mental disorders (and their parents) deserve compassion, attention, and care, not scorn. The book feels less tightly organized than I'd like; I feel that the chapters wander a bit and they kind of melded together in terms of purpose and topic. However, I like Warner's narrative persona and I appreciate very much the amount of research she did for the book. The problem with many of these issues is that we simply do not yet have longterm information on the effects of psychotropic drugs, or enough information on what causes mental disorders. Warner points out that the field of child psychiatry is very small--it is extremely difficult even to find doctors who want to study it. Given these difficulties, it's hard to find the right path to take in regard to these issues, but again, I absolutely support Warner in her sense that it is good to feel compassion for these children/families. Finally, as per usual with Kindle books, the formatting is a nightmare. The design is ruined; the spacing is not attended to; there are typos introduced into the text. This was a more expensive e-book--one of the ones at $14.00, and I have to say it burns a bit to purchase an e-book so ridden with formatting errors. It cannot be that hard to write macros to clean files before they are put into e-book format, can it? Someone in publishing must be able to do it! Comments: I had read a couple of Ken Bruen books in a row and was in dire need of a little Binchy. There was never any question that Deirdre and Desmond Doyle would celebrate a gala twenty-fifth anniversary. Naturally, their daughter Anna, would plan their grand affair. Of all three Doyle children, Anna knew exactly what their mother wished--even as she lived her own secret life. Will Brendan, the rebellious son, even bother to return to London? Will Helen, the hapless would-be nun, embarrass them all? This is Deirdre’s day, a triumph for a woman obsessed with keeping up appearances, her silvery revenge after “marrying down” twenty-five years ago. She’s determined to show them all: the maid of honor, still unmarried, still gorgeous, now a successful London business woman . . . the best man, once Desmond’s close friend, now his boss . . . their reluctant priest, who harbors his own guilty secret. As family and friends gather, a lifetime of lies takes its toll. But what begins as a family charade brings with it the transforming power of love--and truth. 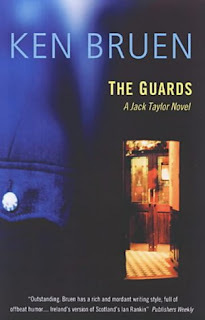 Comments: As you can see, I'm reading the Jack Taylor novels completely out of order, thanks to my inability to consistently find them as ebooks. What's even worse, I had to read the Kindle edition of this one and the formatting was so horrible. I've never seen formatting any where near this bad in either eReader or Barnes & Noble eReader editions. 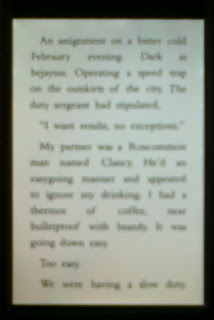 Check it out below: I know it's blurry (it's a picture of my iPod Kindle app taken with my Pre), but you can still see the huge gaps between the words, which means you're constantly turning the page. And that brings up another complaint: I hate having to "swipe" the screen to turn the page. Such a hassle. Why not allow me to just touch the screen like every other ereading app? Come on, Kindle. Help a girl out. Jack Taylor's life is spiraling downward. Dumped from the Garda Siochana ("the Guards"), Ireland's elite police force, he now passes his days drinking in a friend's bar. Enter Ann Henderson, a woman searching for her missing daughter. Jack agrees to take on her case, learning about Ann's daughter as well as other young women who have recently disappeared . . .
Macmillan's CEO on e-book pricing, availability, etc. : here. 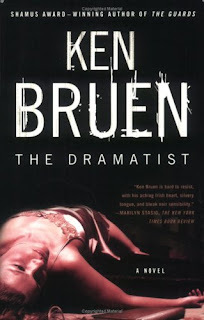 Comments: Don't read Ken Bruen if you don't want your heart broken--his books hurt. This one actually made me gasp audibly at the end. The impossible has happened: Jack Taylor is living clean and dating a mature woman. Rumour suggests he is even attending mass . . . The accidental deaths of two students appear random, tragic events, except that in each case a copy of a book by John Millington Synge is found beneath the body. Jack begins to believe that "The Dramatist," a calculating killer, is out there, enticing him to play. As the case twists and turns Jack's refuge, the city of Galway, now demands he sacrifice the only love he's maintained, and while Iraq burns, he seems a step away from the abyss. Comments: Super fast-paced, foul-mouthed, with graphic descriptions of violence and medical procedures. Fun! Dr. Peter Brown is an intern at Manhattan’s worst hospital. He has a talent for medicine, a shift from hell, and a past he’d prefer to keep hidden. Whether it’s a blocked circumflex artery or a plan to land a massive malpractice suit, he knows what evil lurks in the hearts of men. Pietro “Bearclaw” Brnwna is a hit man for the mob, with a genius for violence, a well-earned fear of sharks, and an overly close relationship with the Federal Witness Protection Program. More likely to leave a trail of dead gangsters than a molecule of evidence, he’s the last person you want to see in your hospital room. Nicholas LoBrutto, aka Eddy Squillante, is Dr. Brown’s new patient, with three months to live and a very strange idea: that Peter Brown and Pietro Brnwa might--just might --be the same person . . .
Now with the mob, the government, and death itself descending on the hospital, Peter has to buy time and do whatever it takes to keep his patients, himself, and his last shot at redemption alive. To get through the next eight hours--and somehow beat the Reaper.